Anti-Antisemitism is lurking amongst new lawmakers in the House of Representatives. House Rep. Rashida Tlaib, D-MI wrote a column in 2006 entitled “Bills must stop deportations for minor offenses,” on The Final Call for Nation of Islam leader Louis Farrakhan. The Final Call is an online publication founded and maintained by Farrakhan. It’s easy to forget that detention and deportation have real and long-lasting effects on families. We are not able to see such negative effects right away, or immigrants fear speaking out. After 9/11, fear between Arab and Muslim communities rose and remain widespread, as repressive policies seem to target particular nationalities. Immigration Customs and Enforcement (ICE) officials stated that this was part of a national operation to apprehend immigrants that committed violent crimes. However, reports from community members verified that ICE began knocking on neighboring homes one by one and took several people into custody without just cause. After publication, a spokesperson for Tlaib said in a statement, “As a former immigration attorney and advocate, Congresswoman Tlaib has published numerous articles about the need for immigrant rights. The goal was to educate citizens about the importance of passing just and humane immigration reform, which is still a priority for her district today. Tlaib later came under bipartisan criticism from Jewish groups for appearing with radical anti-Israel activists during her swearing in ceremony in Michigan. Some of the activists previously praised terror group Hezbollah and Palestinian terrorists saying that Israel has no right to exist. 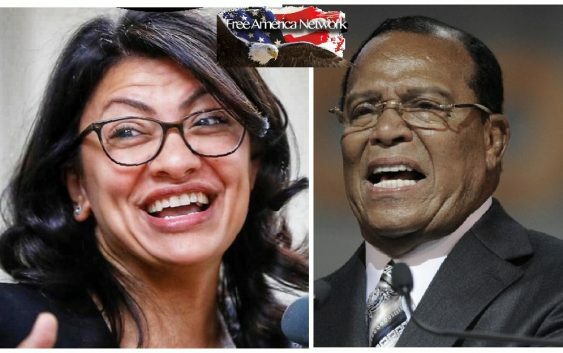 Tlaib’s association with Farrakhan comes after strong criticism of her and other freshmen Democrats who have been accused of anti-Semitism. Tlaib also has a prominent fundraiser who has partaken in anti-Semitic conspiracy theories. Tlaib’s Democratic colleague, another freshman, is Somali American Rep. Ilhan Omar D-MN. She has also faced similar criticisms for thoughtless remarks about Israel and Jewish advocacy groups in the United States. Farrakhan and his followers went on a solidarity trip to Iran in November. In Iran he led “Death to America” chants. During the trip, Farrakhan told Iranian students that “America has never been a democracy,” and also led a “Death to Israel” chant at the end of his talk. This was reported by Iranian news agencies. Antisemitism is not new in the U.S. or anywhere else, for that matter. The fact that it is out in the open and spewed regularly is disturbing. It is pretty much still fresh in our minds what happened at the Tree of Life Synagogue in the Squirrel Hill neighborhood where eleven congregants died when they were gunned down by Robert Bowers.